Knowledge Bridge | Is mobile killing the desktop internet? With mobile growing so rapidly, particularly in emerging markets, there has been much talk of mobile killing the desktop. 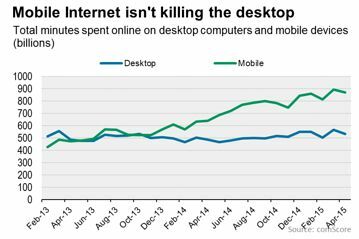 An article in The Wall Street Journal claims that desktop usage isn’t decreasing, as is often claimed. Jack Marshall explains that while the share of the market enjoyed by mobile internet access is growing fast, the total time spentTime SpentThe amount of elapsed time from the initiation of a visit to the last audience…//read more online from desktops isn’t falling and might even be increasing. However, Thad McIlroy on the Future of Publishing blog says this interpretation is misleading. The data The Wall Street Journal bases its findings on “encompasses all desktop computer usage, the majority of which relates to the Microsoft and Adobe application suites as well as email”. “The real story is not that the PC usage is up, but that simultaneous device use — usually called ‘multi-platform’ — has changed the device landscape.” McIlroy says that data from another comScore report, The U.S. Digital Future in Focus 2015, shows that the number of people only using desktops to access the internet is declining sharply in all age groups, even the 55+ segment, and that across all ages the amount of mobile-only users is also growing fast. However, while the amount of mobile access might be outstripping desktop, an Outbrain study in the Asia-Pacific region shows that people consuming content on desktop are much more likely to engage with content compared to mobile, especially when it comes to paid content, reports Trak.in. Of course mobile and desktop are both heavily used to access email. Yesware Enterprise examined more than 14 million messages sent by its users earlier this year to produce a detailed pattern of when and on what device people use to read their emails. This slideshow gives an insight into their findings.